One problem encountered in center driven takeup and letoff velocity mode applications is the nonlinear relationship between the diameter of a roll and the motor speed required to maintain constant surface speed of the roll during diameter increase or decrease. A plot of this relationship shows a hyperbolic curve. When the line speed and roll diameter values are known, the required roll speed can be calculated (i.e. Roll Speed = Line Speed/Roll Diameter). The material surface speed on a takeup or letoff would be held constant during roll diameter changes. Furthermore, in torque applications, the torque required to maintain constant tension is proportional to roll diameter. 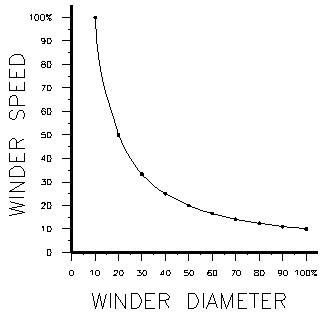 When the line speed and roll rotational speed values are known, the required torque can be calculated (i.e. Roll Diameter = Line Speed/Roll Speed). The tension applied to the material on a takeup or letoff would be held constant during roll diameter changes. 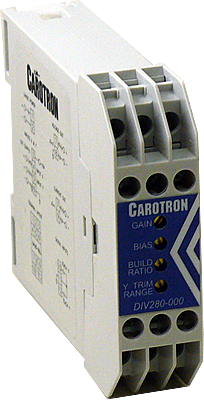 Multiturn GAIN, BIAS, BUILD RATIO, and Y TRIM RANGE potentiometers are used to calibrate the DIV280-000 module. An internal jumper allows selection of a voltage or current output. Onboard EEPROM is used to backup and retain the calibration values during a power loss.